The back copies of The Leninist, the journal of the Communist Party of Great Britain and later the CPGB Provisional Central Committee, have been uploaded. Visit this site to view issue 1 through 116. Issue 114 details the relaunch of the Anti-Nazi League by the Socialist Workers’ Party. 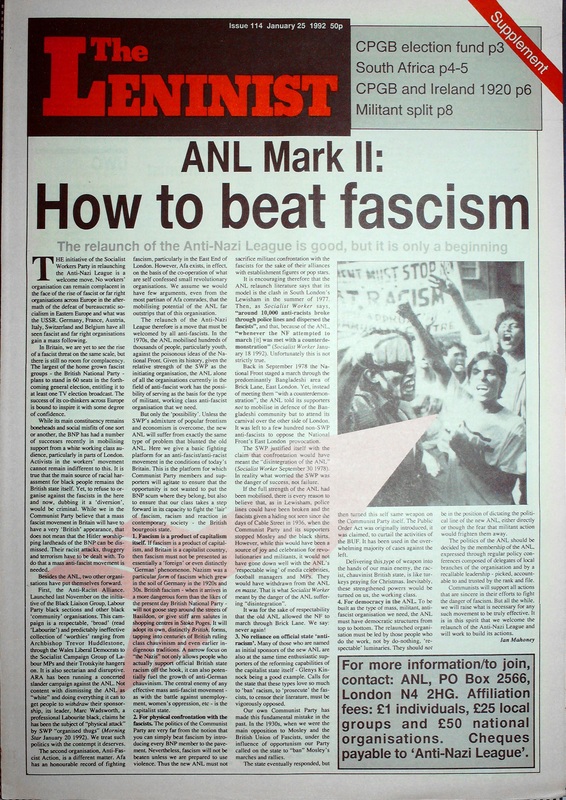 The Leninist supports the new ANL over Anti-Fascist Action because they suspect it will be able to field more numbers. It does commend AFA for its work and calls for a continuation of the physical confrontation of fascists. Download the whole newspaper here. This entry was posted in Anti-Fascist and tagged Anti-Fascist Action, Anti-Nazi League, Socialist Workers' Party, The Leninist. Bookmark the permalink.